The second half of October was quiet, with few birds banded. With the unseasonably warm fall weather and persistent south winds, birds seem to be rather slower to migrate than in previous years. Very few ducks and waterfowl have been seen so far and even as late as October 22nd there was not a lot of activity on the lake aside from a few Scaups (whether Greater or Lesser was impossible to say) and the first Bufflehead of the season, which was spotted on the 23rd. It wasn’t until almost the very end of the month that the duck migration began to pick up. 39 Horned Grebes were seen on the lake on October 28th and over 200 Red- Breasted Mergansers were counted on census on the 30th, while the first Hooded Mergansers of the season were seen on the 31st. Although the late fall is the peak time for sparrows to be migrating, only two sparrow species were observed on October 16th (White-Throated Sparrow and Swamp Sparrow). More sparrow species were observed on the 19th, including Dark-Eyed Juncos, a Fox Sparrow, and one Lincoln’s Sparrow. The first American Tree Sparrow of the season was seen on October 20th. A single Snow Bunting was seen on census on the 23rd, as was a Red-Eyed Vireo foraging with some Myrtle Warblers – an unusual juxtaposition, as Red-Eyed Vireos have generally left on migration well before the Snow Buntings show up. Another surprising sighting was of a Yellow-Billed Cuckoo that was observed and banded on October 18th. Generally the last time that PIBO officially observes a cuckoo is in mid- to late-August and previously the latest that a Yellow-Billed Cuckoo had been banded was August 29th, in 2013. The wind shifted to the north on October 19th and made a noticeable difference to bird activity. A Great Horned Owl and an Eastern Screech Owl both greeted us as we began our banding operations, and seventeen Hermit Thrushes were banded over the course of the morning. One of them stayed on the island long enough to be recaptured on both October 22nd and 24th, during which time PIBO’s records showed that it was busy gaining weight before continuing its migration. 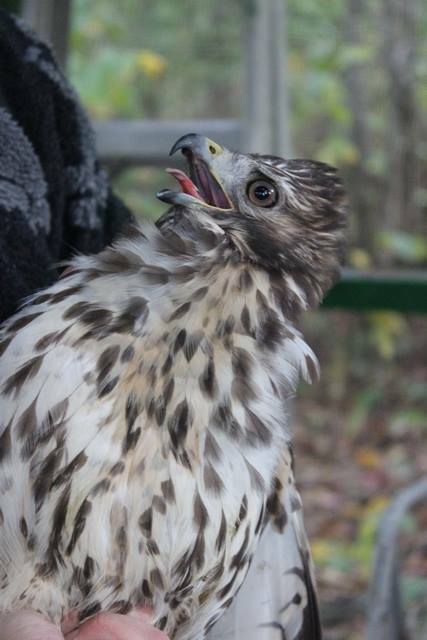 October 25th began with a surprise for PIBO’s field staff – the capture of a juvenile Red-Shouldered Hawk! It is the first one banded at the station, and is by far the largest bird that PIBO has ever banded. Most large raptors stay high above the trees and are only ever seen on census or as part of our visual observations, but this one decided to take a short flight through the dogwood trees and ended up in one of our mist nets. Fortunately PIBO keeps a variety of sizes of bird bands on hand for just such an occasion, and the Red-Shouldered Hawk itself was very cooperative during the banding process. However quiet it was in the netting area in the last half of October, plenty of activity was provided by the large flocks of diurnal migrants who were observed flying over the netting area, around Fish Point, and out over the lake. Common Grackles, Brown-Headed Cowbirds, Red-Winged Blackbirds and European Starlings all prefer to migrate during the day (as opposed to other songbird species like warblers and vireos, who migrate at night), and form enormous flocks of many thousands of birds to protect themselves from predators. Their squeaking, honking, chattering calls form a distinctive part of the sounds of autumn on Pelee Island. On October 22nd, PIBO’s first public owling night was attended by fifteen islanders and one very grumpy Eastern Screech Owl. The second public owling night on October 29th was also well-attended – but not by owls! An ill-timed warm front meant that the conditions were not good for Northern Saw-Whet Owl migration, and although one Eastern Screech Owl was heard calling in the alvar it didn’t come close enough to be caught. PIBO’s third and final public owling night will take place on November 5th from 7 to 9 p.m. at the PIBO cottage on Stone Road. We hope to see you there!